“Deck the halls with boughs of holly” – these are the words of a well-known carol and Holman Hall was certainly lovingly decked for Christmas with a huge Christmas tree and many twinkling lights around the massive hall at their beautiful home in the Old Turkish Quarter of Girne. 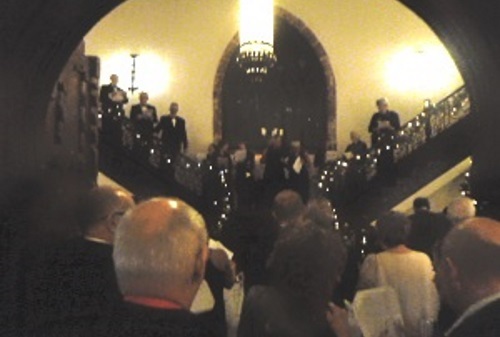 On 23rd December 2016 Nigel and Lynn Holman invited many guests to join them to celebrate Christmas and when we arrived there were throngs of people gathered and carol singing was in progress with a choir on the staircase leading the singing of many of our favourite carols….. There were many familiar faces, the wine flowed freely and after the carols the guests wandered to the kitchen to sample the food which had been prepared during the evening. There was plenty for all and it was delicious. We then had a chance to talk to some of the people we know who were thoroughly enjoying the evening and later some decided to dance to the background music which was playing. The Holman’s certainly know how to throw a party and we thank them for inviting us and wish them a Merry Christmas and a Happy New Year. 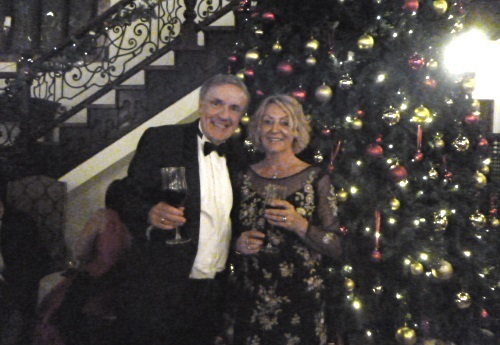 This entry was posted in British friends, Events, Friends Pages and tagged Christmas in North Cyprus, Nigel and Lynn Holman, North Cyprus, TRNC. Bookmark the permalink.